RCS could be probably deployed much faster if it wasn’t that general right from the beginning. To implement a simple 1-1 chat is not a big deal. The same applies for voice and video. And honestly one doesn’t expect much from a new product as long as the basic functionality is working fine. Well, in case of RCS/RCSe group messaging was always referred as a basic one. But sometimes it was not without struggles. There are many ways how a Conference can be established. Just to find out all the relevant RFCs is not an easy task. 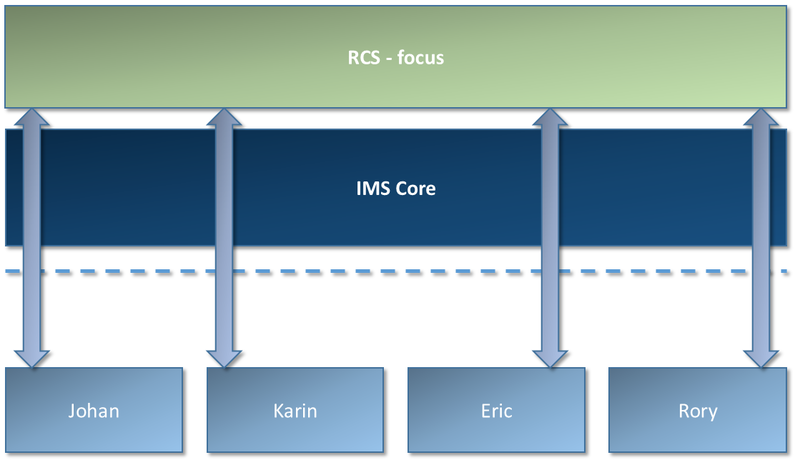 RCS Group Chat technical realization is based on the “Ad-Hoc Session Mode messaging”. RCS is referencing to OMA-SIMPLE or OMA-CPM. OMA is defining their ways how to handle the chats and pointing to particular RFCs. Many of them. The basic one is the RFC 4353. In this document it is described the logical architecture. Simply put group messaging is a multi 1:1 chat. All the participants will establish a 1:1 chat with a center point called “focus”. This logical role is implemented as a part of RCS (CPM/SIMPLE) server functionality.